Greener Lives: Worried about air pollution? Get out of your house! Worried about air pollution? Get out of your house! Believe it or not, the air inside homes is typically three to five times more polluted than the outside air. Indoor air can be up to 100 times more polluted than outdoor air. One reason indoor air is getting worse is because we're making our homes more energy efficient. Talk about ironic. The biggest cause of bad indoor air quality (IAQ) is volatile organic compounds (VOCs). Know that "new paint" or "new furniture" smell or even that "new car" smell that people love? That new paint, furniture, car and more smell happens when carbon-based chemicals in the products off gas easily. Like gasoline, all VOCs evaporate when they're exposed to air. That smell may make you think something is fresh and new. It may be new, but it's not fresh. VOCs cause everything from headaches and scratchy throats to respiratory problems. Formaldehyde, which is used in the glue that binds particle board and plywood together, causes cancer. You can't smell formaldehyde, and unlike some other VOCs, it can take up to 20 years to completely off gas. Worst of all, formaldehyde is used as a finishing agent on permanent-press and wrinkle-free sheets. If you have permanent-press sheets, you're spending around a third of your life snuggled under the sheets inhaling a carcinogen. Thinking about that is enough to make anyone an insomniac! It's time to switch to organic cotton sheets or at least 100% cotton sheets that wrinkle. (Yes, wrinkles are good.) Sheets made of cotton jersey or alternative materials like bamboo and eucalyptus are two other options. Eucalyptus and bamboo sheets are both very soft, and eucalyptus sheets are also antimicrobial and resistant to dust mites. 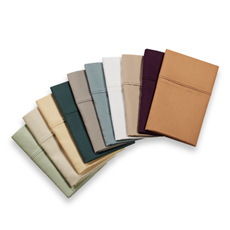 Eucalyptus sheets are now widely available in many colors like these from Bed, Bath and Beyond. Back to the irony of green homes that are energy efficient and toxic - it's all about the building envelope. These days Americans are doing everything from caulking window frames and replacing door sweeps to installing energy-efficient windows and adding insulation. The point is too keep outside air from coming in and inside air from escaping by tightening the building envelope. The problem with tightening the building envelope is that all of those VOCs as well as dust, pollen and other pollutants are trapped indoors instead of escaping out old, leaky windows. What to do? Either open your windows regularly, ideally 10 minutes a day, or install an air exchange unit. The best option is to install a heat-recovery ventilator (HRV) or an energy-recovery ventilator (ERV). Both systems draw fresh air into the home and simultaneously exhaust stale air from the home. During this exchange, the heat from one airstream is transferred into the other to reduce the loss of heat in the winter and cold in the summer. New energy-efficient homes typically come with air exchange units. 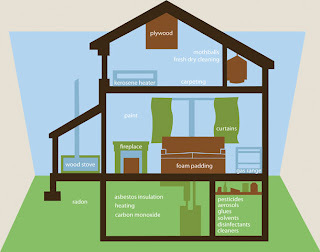 For a list of 10 ways to improve your home's indoor air quality, check out my brochure "Clearing the Air: Healthier Living in a Greener Home." To improve your indoor air quality,consider installing an air cleaning system to expel air contaminations from you're home.There are various diverse air cleaning systems and devices that will expel solid and gaseous contaminants from the air.It's additionally important to verify that you're home is well-ventilated.An ineffectively ventilated home can trap air toxins inside.Great ventilation likewise lessens humidity levels and can help keep the growth of mold and mildew in you're home.